Go the extra mile with the right tires at the right price, from Firestone Complete Auto Care. We're your local tire shop in Hutto, TX! When it's time for new tires, Hutto Firestone Complete Auto Care is the best place to go. Whether your trusty ride is a truck, car, crossover, or minivan, you'll find some of the best tire deals! We'll walk you through the options to help you settle on the best set of tires for your climate, driving style, and vehicle. Shop the entire tire catalog online and learn about some of the most-loved brands in the business, Firestone and Bridgestone. Then stop by your nearest location for expert tire installation. From run flat tires to eco-friendly tires, your nearby Firestone Complete Auto Care will keep you rolling with the right wheels. Unsure if it's time to change your tires? Our experienced technicians can help, but you can do a quick inspection in your driveway too. First, check your current tires for tread wear. If the tread looks slick and shallow, your tires might struggle to grip the road safely. That's a safety problem! Watch out for bumps, bulges, tears, or sidewall cracks, and figure out how old your tires are. 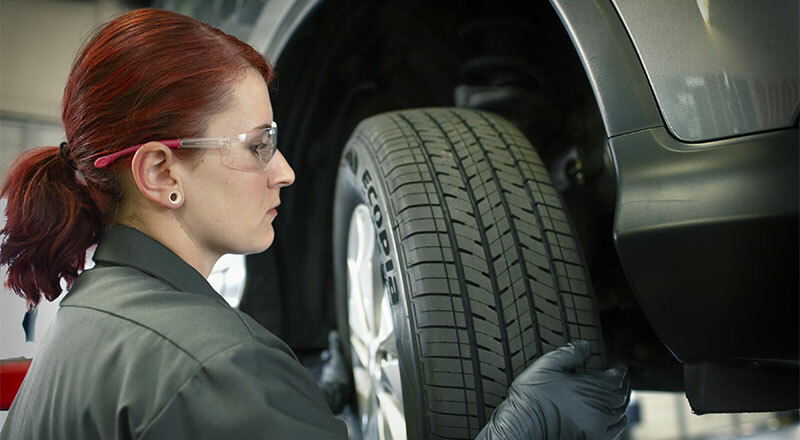 Even if your tread wear looks fine, most car manufacturers suggest having new tires installed every 6 to 10 years. It can be a safety concern, something that's very important to us at Firestone Complete Auto Care in Hutto. Chart a course towards adventure or a smoother commute with the right tires from your nearby tire place, Firestone Complete Auto Care. You'll find the size you need from brands you trust, like Primewell, Bridgestone, and Firestone. Trust us with your wheels and you'll get much more than professional installation and advice. You'll also receive free tread and pressure checks, along with quality flat tire repair, rotation, and alignment. We've been a top tire shop in Hutto for decades, and one of America's leading tire companies for nearly a century. For quality service at spectacular prices, choose Firestone Complete Auto Care. Browse tires online and schedule your installation today! From transmission work to batteries to headlight replacements, turn to your local Firestone Complete Auto Care for your automotive service needs. We're an automotive shop, tire store, and car care center wrapped into one. Our automotive technicians believe in truly complete auto care. When you bring your car or truck to us for maintenance, we’ll strive to provide unparalleled auto services. Experience the difference! Make an appointment for auto service in Hutto, Texas today.